The rain has arrived. The snow is melting. The ground is slowly becoming visible, the fragrance of spring is rising up, and the birds swoop overhead and joyously muck about in the ground cover of leaves that did not get picked up before winter set in. This is all good. It is a wonderful time to sit and breath, and listen to the chorus of birdsong and the rush of winter passing as she finds her path down the mountain creek that passes by our house. 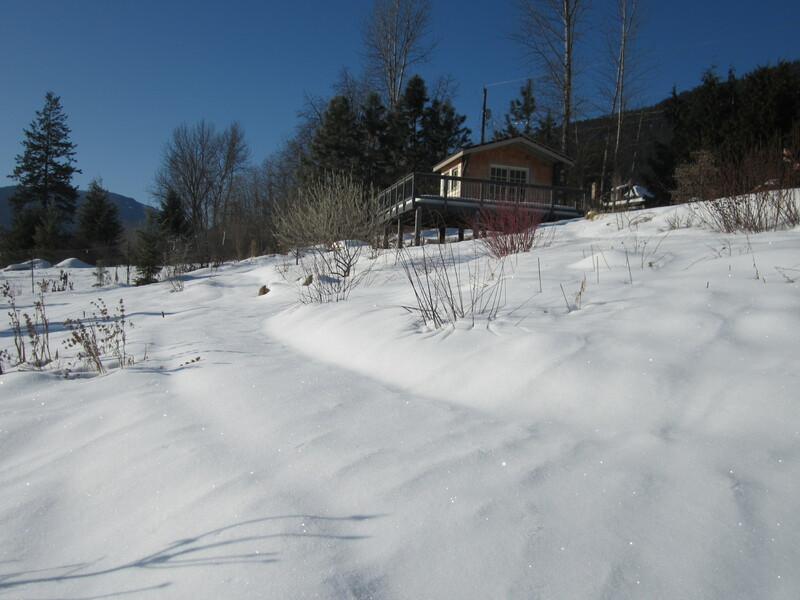 But alas, the full evidence of spring’s arrival remains covered with a persistent blanket of snow that keeps my gardening enthusiasm at bay for a while longer. I know that there is work to be done before the snow is completely gone. As I browse my list of early spring tasks that I could take care of, there is one that rises to the top – “tool clean up and maintenance”. Every year it is my good intention to clean, sharpen and repair my hand tools in the fall, after the gardens are put to bed. But, by the end of the season I have little interest in going beyond the act of gathering them up and hanging them on the rack where I will let them be for several months. Where to start? 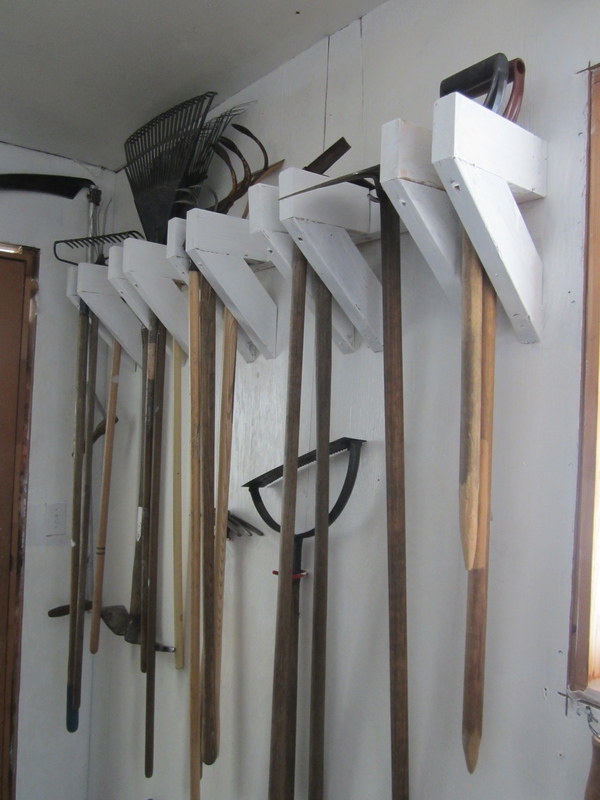 Sorting and taking inventory of our shovels, spades, rakes, hoes, edgers, and numerous trowels and pruning tools lets me know if I inadvertently left any tools outdoors, or if repairs or replacements are needed. (I must admit that shopping for good tools is almost as much fun as an early spring visit to a nursery or garden centre.) Starting with my favorite tools (edgers and secateurs) generally gets me into the swing of tool maintenance. An edger is a simple tool with one flat, half circle blade and a handle. Not much to take care of, but a good tool to practice sharpening techniques on. I use a file to grind the edge on front and back faces of the blade with long sweeping strokes. The end result is a blade that will easily cut through overgrown garden bed edges, creating a precise line that separates garden from grass. This a good warm up for the slightly more complicated maintenance program for my secateurs or hand pruners. 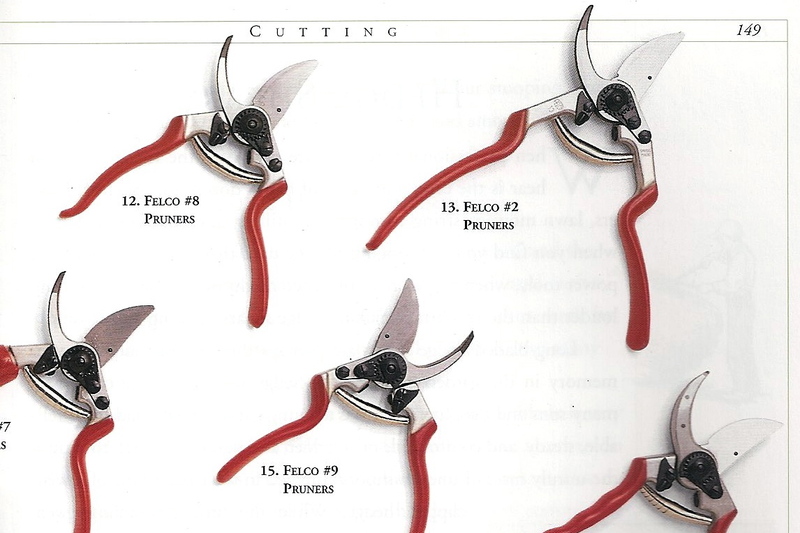 If you like pruning, dead heading, or generally cutting back any plant that needs it, a pair of secateurs is a must have. Designed to cut through woody stems up to three – quarters of an inch, they handle herbaceous perennial stems and stocks, small branches and twigs on shrubs and trees, or bunches of garden herbs with ease. A well-maintained pair that has been cleaned, oiled and sharpened cuts easily and cleanly, and requires less hand strength to cut through the vast amount of woody plant material that I encounter throughout the gardening season. That’s all well said, but there is a glitch to keeping this prized tool in good working order. Every year when I go to dismantle my hand pruners for a good clean up, I have the dreaded fear that I will lose a part or put them back together wrong. So, paying strict attention to the disassembly I place all parts in a line and in the order that they came away from the tool so that I can reassemble them without a lot of guessing. Clearly, once-a-year maintenance is not enough for this procedure to stick in my mind from one season to the next. 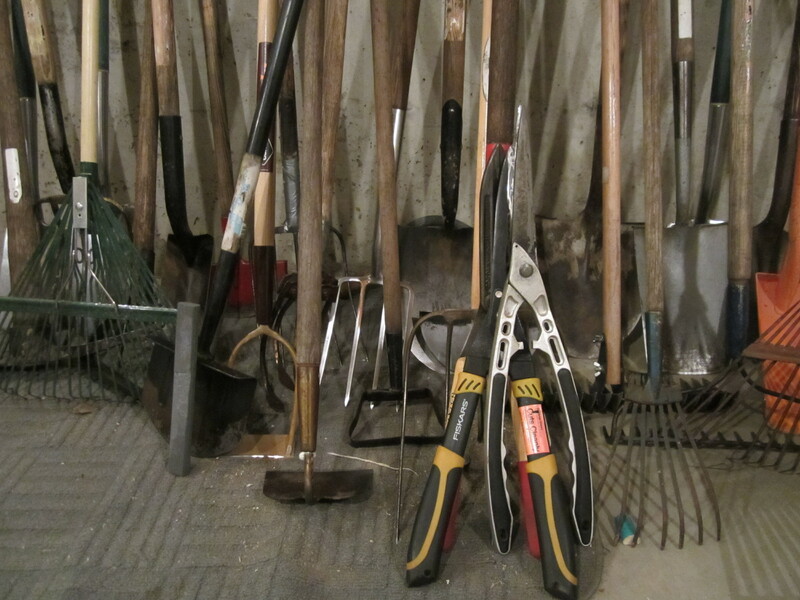 Once apart I use a wire brush to remove any build up of soil, grease and grime that has accumulated on the handles, small gears and blades; wipe off any remaining residue; sharpen blade with a fine sharpening stone; reassemble; oil spring and gears; and start pruning! At the end of a good gardening day I clean the blade, and give it a quick stroke with the sharpening stone so that its sharp edge stays sharp. A good practice, and a good way to avoid the disassembly/reassembly procedure. 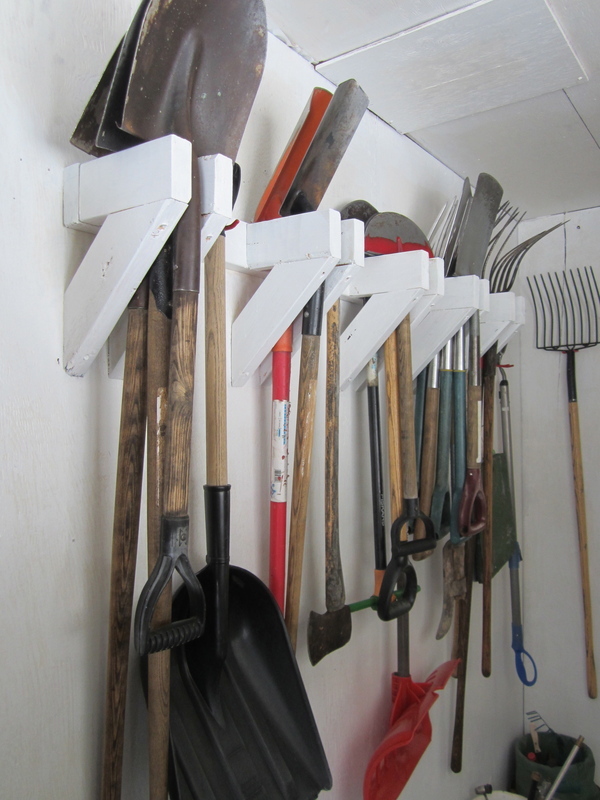 Onward and forward…to the tool shed.